The Disney resort hotels are really a sight to see. 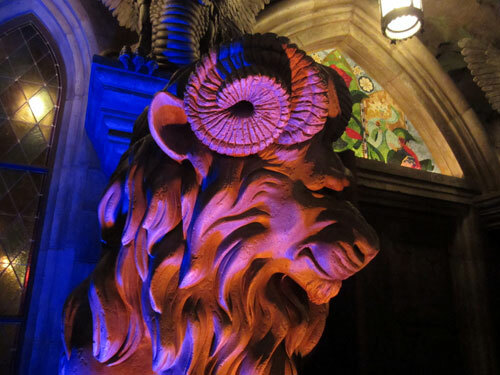 They’re all uniquely themed with everything from a larger-than-life statue of Ursula or a 1990s laptop to grand Victorian-style staircases and live animals. Many people don’t realize that any guest can visit any of the Disney Resort Hotels, whether they are staying on Disney property or not. Please note that during extremely busy times of the year, Disney security may restrict entry to the resort parking lot to only those who have ‘business’ – such as a confirmed dining reservation – to enter. You can always take Disney transportation into a resort, but that may take a while. 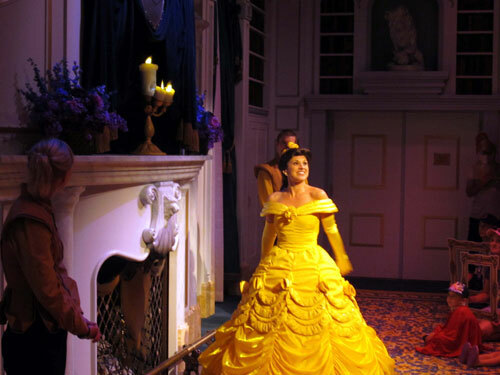 I thought it would be fun to take a look at the top five resorts that you should see and experience while you’re on vacation in Walt Disney World. Disney’s Grand Floridian Resort and Spa is Disney’s flagship hotel and has a unique Victorian Florida theme that is luxurious and sophisticated while still being true to Disney’s family-friendliness. Located at 4401 Floridian Way, Orlando, FL off Seven Seas Drive, the hotel is accessible by Disney’s free transportation via bus, ferry, and monorail. There is also a one-mile walking path between the Grand Floridian and its neighbor, the Polynesian Resort. Disney’s Grand Floridian Resort is so special because it is classic, and it feels like you’ve stepped into an old postcard. The five-story lobby has a grand staircase, a cage elevator, fancy tile-work on the floor, stained glass domes overhead, and elaborate chandeliers. During the holidays, there is an equally grand Christmas tree in the lobby alongside a life-size gingerbread house. All year, a live pianist and the Grand Floridian Orchestra take turns playing turn-of-the-century music. If you’re looking to do some shopping, you’ll find more stores here than at any other resort hotel, so it’s a great place to find exclusive resort merchandise. 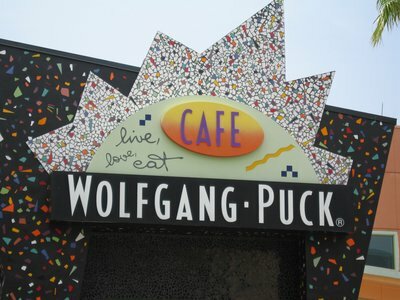 This is also a great place to eat! Victoria & Albert’s, a AAA five-diamond restaurant, is the fanciest and most expensive restaurant on property, but it’s worth the splurge for a special occasion. 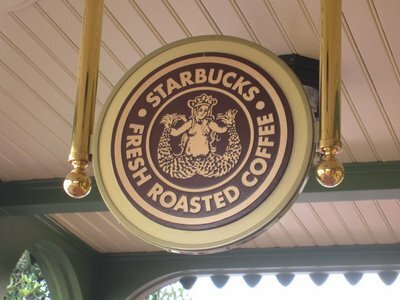 Citricos, Narcoossees, and the Grand Floridian Café are also excellent as is 1900 Park Fare, a character dining experience, and Garden View Tea Room, which hosts an English-style tea party every afternoon. Advanced Dining Reservations are recommended for all of these restaurants and required for some like Victoria & Albert’s. Finally, the “and Spa” part of this resort’s name is a fun and special experience for guests of all ages. Senses Spa is a great place to relax because it’s a full-service salon and spa and has services specifically for kids. Did someone say Mother-Daughter day? Disney’s Polynesian Resort is one of the original resorts from the 1971 opening. It has since been remodeled but still carries on the immersive South Pacific theme. The Poly, as it is lovingly called, is located at 1500 Seven Seas Drive, Orlando, FL and is accessible by bus, ferry, or monorail. 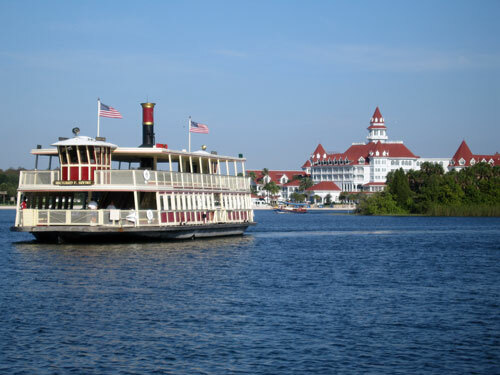 You can also walk to or from The Grand Floridian Resort or The Transportation and Ticket Center (TTC). If you walk from the TTC, you might want to ask a Cast Member for directions since the route is a little tricky. The Poly has great style. One of my favorite events at the Poly is the Spirit of Aloha Dinner Show. Captain Cook’s and the Kona Café are good, too, and often underrated. Be sure to try Kona’s tonga toast! If you like Dole Whip, consider getting a cup, cone, or float at Pineapple Lanai and avoid the line in Adventureland! The Polynesian also has some of my favorite views of Magic Kingdom. The white sand beaches are a great place to watch Happily Ever After, and you’ll have a great spot for see the Electric Water Pageant. Disney’s Animal Kingdom Lodge is arguably one of the most unique hotels in the world since it is situated on a huge savanna. You can’t get this close to wildlife unless you’re actually on an African Safari – no passport necessary! 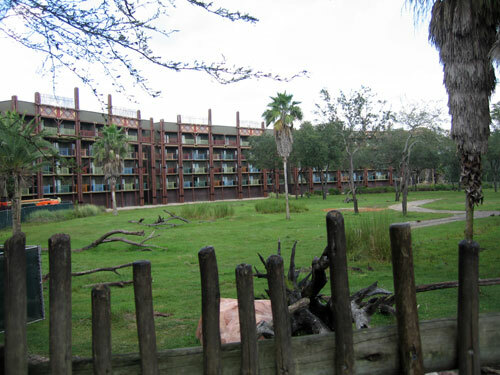 Animal Kingdom Lodge, like Disney’s Animal Kingdom Park, is removed from the rest of the resort and is only accessible by driving yourself (address: 2901 Osceola Way, Bay Lake, FL) or by Disney bus. A visit to Animal Kingdom Lodge is like going on a safari. If you have to ask why you should visit Animal Kingdom Lodge, you haven’t been reading carefully – it’s the animals, of course! If that’s not reason enough, know that there are two lobbies at each of the resort areas- Jambo and Kidani. The lobby in the Jambo house is massive and one of Disney’s best. There’s a huge wall of windows that overlook the savanna, tribal shield chandeliers on the ceiling, a thatched roof, a mud fireplace, and a waterfall system that trickles down to the lower floors of the resort. 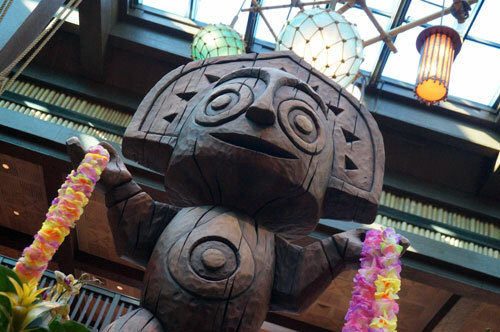 What’s more, the dining at Animal Kingdom Lodge will have you longing for more cultural experiences. Each restaurant serves African-inspired dishes as well as some more familiar ones. Boma – Flavors of Africa is a delicious buffet on which you’ll find one of Disney’s best desserts: zebra domes. These little pieces of heaven have an Amarula Cream Liquor Mousse under a white chocolate shell atop a thin chocolate cake. If you want to try them but can’t eat at Boma, you can pick up a couple at The Mara, the quick-service dining location at the resort. Sanaa and Jiko – The Cooking Place are also top rated eateries, and Jiko has a stage kitchen, which is perfect for the foodie in the family! Disney’s Contemporary Resort was also one of the original hotels on property. With some targeted updates over the years, it still feels modern, in a special retro and Disney sort of way. It’s ideal location across the street from Magic Kingdom at 4600 North World Drive, Orlando, FL means it’s not only accessible by bus, ferry, and monorail, but it’s also a short walk from Magic Kingdom. Did someone mention monorail? Oh yes, this is the only resort at which the monorail goes right through the middle of the hotel! 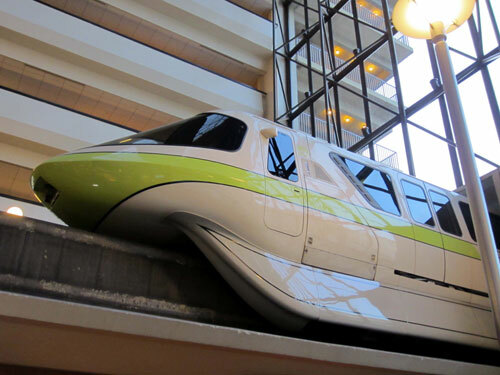 There’s nothing like watching monorail trains zip over your head! Disney’s Contemporary: location, location, location! Another reason to visit is the dining. Chef Mickey’s is one of the top rated character dining experiences, and California Grill sits high atop the main hotel building and provides unmatched views of Magic Kingdom (and especially Happily Ever After) while serving chic California-inspired dishes. Don’t rush through the lobby just to get to these sites because Disney Imagineer, Mary Blair has created an amazing mural inspired by It’s a Small World, and it’s displayed in the lobby! Can you find the five-legged goat? 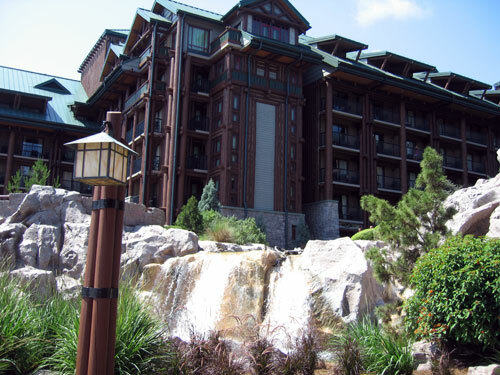 Disney’s Wilderness Lodge is Disney’s attempt to bring the grandeur of the national park lodges of the American Northwest to Central Florida. This peaceful retreat is located at 901 Timberline Drive, Lake Buena Vista, FL, and it’s accessible by bus and ferry. 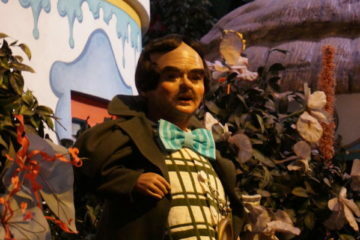 Despite the Lodge being a Deluxe Resort in the Magic Kingdom area, it is not on the monorail line. There is, however, a .75 mile walking path between the Lodge and Disney’s Fort Wilderness Resort. Disney’s Wilderness Lodge feels like it is a million miles away from the hustle and bustle of the Magic Kingdom. To start, the eight-story lobby has a Grand Canyon-themed fireplace, teepee chandeliers, totem poles, and a bubbling spring with a crossover footbridge. This spring flows right into the Silver Springs pool, which is just outside the main building. Like other Deluxe Resorts, there’s an amazing Christmas tree here sometime just after Halloween through just after Christmas. 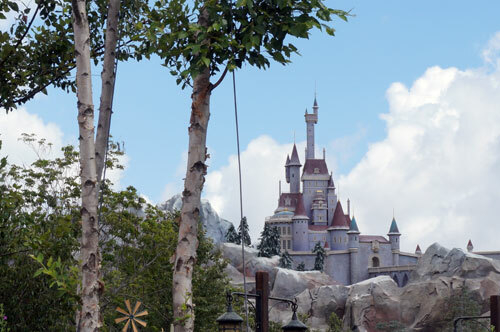 You’ll appreciate the natural decorations that contribute even more to the theming and mood-setting for the season. The main lobby isn’t the only lobby on property though. Boulder Ridge Villas, which is a Disney Vacation Club location, provides a quiet oasis with rocking chairs and board games. Boulder Ridge is also home to the Carolwood Pacific Room, which honors Walt Disney’s love for trains. When it comes to dining, the restaurants are just as peaceful and welcoming as the lobby. Artist Point is a Signature Dining location that accepts Advanced Dining Reservations. Guests can dine indoors with views of Bay Lake and Silver Creek Falls or outside on the terrace. Whispering Canyon has a Native American theme with a buffet to match. The “frontier fare” matches the theme, and reservations are recommended for this unique/themed dining. Perhaps the coolest feature at this resort hotel is Fire Rock Geyser, which spews water every hour just like Old Faithful! Do you resort hop at Disney World?